Truckee's Skyler Flora (white shirt) won both the 1,600 and 3,200 at the Husky Invitational in Sacramento this past weekend. Truckee track coach Diana Yale is looking for daily coaching help for field events. Contact Yale at dianafyale@gmail.com for more information. After their highly successful season debut in Folsom, the Wolverines traveled to Yerington last Saturday to scope out their regional NIAA track and field competition. While Truckee was not able to field a complete boys team, the girls team dominated the meet, with a record-breaking 157 points in a field of 15 teams, outscoring second-place Yerington by 62.5 points. Once again, senior Quinn Parker led the way, with three first-place finishes, in the 100-meter dash (12.94), 200 (26.60) and 400 (59.30). Other gold medalists in Yerington included sophomore Olivia Yale in the 800 (2:28.76), sophomore Chloe Wall in the pole vault (7-06.00) and freshman Heather Pendleton in high jump (4-08.00). What is most impressive about the girls team in particular is its relative youth. Nearly half the team is comprised of freshmen. “These girls have extraordinary talent, and they’re really quite young,” Yale said. Right behind Parker is freshman Brenna Wapstra-Scott, who finished fourth in the 100 (13.66), third in the 200 (27.72) and second in the 400 (61.30). Other top freshmen finishers were Carrie Bradley, second in the 3,200 (12.52.88), Syra Fillat, third in the 800 (2:35.56), Marlena Montano, fifth in the 800 (2:47.94), and Pendleton, fourth in the 300 hurdles (53.80). Triple jumpers Hayley Thomas (29-00.00) and Montano (28-07.00) placed fourth and fifth, respectively. Equally impressive is the unprecedented depth of the girls team. Not only were the Wolverines able to field two 4 x 400 teams, they placed first and second, well ahead of their nearest competitors. The all-freshman team of Julia Veliquette, Montano, Wapstra-Scott and Pendleton finished in first with a time of 4:19.99, while Heather Lade, Parker, Yale and Fillat placed second in 4:25.93. The all-freshmen girls 4 x 800 team, comprised of Claire Lang-Ree, Veliquette,, Fillat and Bradley, also emerged victorious in 10:24.38. The Truckee boys team finished 10th in a field of 16 teams. Top individual performers included sophomore Colin Deurlington, who placed fifth in the 800 (2:12.52) and sixth in the 400 (54.85), senior Nick Morgan, fifth in the 3,200 (11.26.70), sophomore Tony Moretti, seventh in the high jump (5-04.00), and junior Eli Yale, eighth in the 400 (55.40). The top boys relay performance was a second-place finish in the 4 x 800 in 9:06.38. The team was comprised of senior Ian Wilson, along with Morgan, Yale and Deurlington. “Overall, it was an excellent meet and good for team morale to compete so well against schools in our league,” Yale said. Meanwhile, juniors Skyler Flora and Gabrielle Rinne traveled to Sheldon High School in Sacramento to the Husky Invitational in order to secure sea-level seed times for upcoming invitational track meets. This mighty team of two managed to finish sixth overall in a field of 20 mostly D1 California teams over 20 times their size by taking home gold medals in each of their three events, winning by sizable margins in large California-sized fields of competition. Flora showed her unparalleled endurance by easily winning both distance events: the 1,600 (5:09.97) by nearly 7 seconds in a field of 64 runners and the 3,200 (11:23.35) by 4 seconds in a field of 37 runners. Rinne set a blistering pace in her middle-distance specialty, the 800 (2:16.35), and never looked back, winning by over 6 seconds in a field of 55 runners, which is the eighth-fastest time in the nation among high school juniors this season. 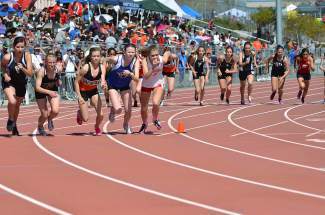 For complete results of both the Yerington Relays and the Husky Invitational, see http://www.athletic.net. Next up for the Wolverines is the LeFebrve Relays at Placer High School in Auburn on Friday.